You will need to have at least one knowledge manager to lead the KM initiative. Knowledge management is everyone’s responsibility, not just the work of knowledge managers. But knowledge managers are needed to raise awareness, align knowledge actions with business priorities, promote a knowledge sharing culture, engage senior leadership, manage the infrastructure, and support all knowledge workers. “Connectors are those with wide social circles. They are the hubs of the human social network and are responsible for the small world phenomenon. They connect people to each other. Mavens are knowledgeable people. While most consumers wouldn’t know if a product were priced above the market rate by, say, 10 percent, mavens would. Bloggers who detect false claims in the media could also be considered mavens. They help people through sharing knowledge. Knowledge managers know how to use KM tools, how to ask others for help, who should be connected to whom, who would benefit from a piece of information, and how to persuade others to use information effectively. One role of a knowledge manager is subscribing to many information sources, belonging to many communities, and reading many publications, always looking out for what may be useful to others in the organization. All good managers should do these things, but they may not how to best do so. A KM program can support managers in all of these activities. Good knowledge managers regularly inform their management colleagues about an article, book, presentation, or con call which was relevant to their areas of responsibility. These colleagues can subscribe to the same sources and join the same communities, but if not, they will appreciate being selectively alerted when content applies to them. All knowledge workers in the organization should view sharing, innovation, reuse, collaboration, and learning as part of their jobs. But as Malcolm Gladwell wrote, not everyone is a connector, maven, or salesman. So those who play these roles, and especially, those who combine more than one of these roles, can function as power knowledge workers, facilitating knowledge flow throughout the organization. Good knowledge managers have worked in many different roles so that they have experienced first-hand the needs of employees. They know about the organization, including who does what, where to find information, and the ways things get done. Within the organization, they are active in communities, subscribe to newsletters, attend seminars and conference calls, and visit web sites. Outside, they attend seminars and conferences, read books, subscribe to periodicals, visit blogs and web sites, and participate in online communities. Knowledge managers look for knowledge-related needs that are not currently met, and try to develop ways to meet these needs using people, process, or technology. They like to help others who are looking for information, trying to figure out how to use tools, or seeking others. They introduce people to one another, invite them to join communities, and pass along items of interest which they encounter. 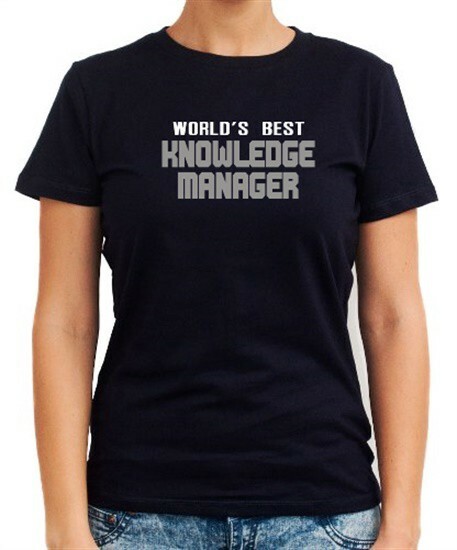 Knowledge managers fill the roles of KM leaders, project leaders, and knowledge assistants. Here is the profile of a good knowledge manager. Improve business results by institutionalizing a knowledge sharing culture. With the help of the senior executive and the other leaders in the organization, take steps to achieve a positive culture which rewards caring, sharing, and daring. Define, maintain, and execute the KM implementation plan for the organization. This is the overall program plan for the KM initiative. Define, communicate, and implement people, process, and technology components for sharing, innovating, reusing, collaborating, and learning. These are the core elements that enable the KM program. Define KM measurements and rewards for the organization and KM goals for all relevant members. This aligns individual and organizational objectives. Report regularly on the organization’s performance against KM metrics. This lets the leadership team know how the program is progressing. Implement action plans for people, process, and technology projects. These are the detailed implementation plans for each project leader. Lead the organization’s KM teams. These include the program staff, the core team, and the KM community. Manage the organization’s KM communications. This keeps all users informed on the program. Actively participate in communities. Model the desired behaviors by being visible as a leader and member of multiple internal and external communities. Network with other KM Leaders. Demonstrate the use of social networks to stay current in the field of knowledge management. Articulate the end-state vision: what does it look like when it is working? Start working on getting to the vision right now, in small steps, and with measurable progress. Define compelling use cases: don’t talk about adoption or rollout of a tool — talk about the advantages of using it over existing alternatives. “Share Relentlessly what you have created and what you are learning. Be a role model for those around you. Search First looking to find, reuse, and refine what others have done before creating something from scratch. Listen to what others are saying. Communicate, Ask and Answer in the Open using email only when absolutely necessary. Make your work and your talents discoverable by working out loud. TAG, TAG, TAG what you create so others can find it. Seek Active Collaboration for tasks both small and large. The sum is always greater than the parts. Build Social Capital as if it matters as much as financial. Build your personal network and connect people so they can enhance theirs. Act on Your Ideas for creating and sharing knowledge. Leverage company KM resources. “Be a Knowledge Citizen — Display accountability for sharing, re-using and improving collective knowledge to create greater value. Be Social with a purpose — Be an active participant of your organization’s Communities of Practice. 11. Jian Ann Howard Wong: “One of the key words here is ‘sharing.’ For knowledge managers, there is this huge problem if they like to take the back seat, observe the process and later giving this big reveal, which the people they are managing may simply take it as it is without perhaps questioning its viability or authority. Some knowledge managers also like to simply input a small portion if things go off tangent, otherwise they will just withhold their thoughts. We need managers to share, because this information can either make or break something. We also need such managers to be humble instead of being prideful of their knowledge.